How do you write a competitive research paper? Here are 10 points that can guide you towards realizing your goal to win. Getting awarded for a research paper I hurriedly prepared within a three-day period is something that confirmed my approach in research writing. Last Thursday, August 14, the paper I wrote based on a nine-month project completed in 2013 garnered the third prize in the 8th Philippine National Health Research System (PNHRS) Contest under the professional category. During the convention, I learned that a total of 31 entries were submitted from all over the country for a double-blind review by experts in the field of health. And only three research papers made it – mine included. More than 500 participants nationwide coming from the 17 regional health research consortia participated in the event. A senior colleague and once the university’s Vice-President for Academic Affairs was instrumental to my success as she prodded me to join the contest although I had misgivings because the deadline was three days away. Despite my apprehension, I confidently nodded and said okay. I thought I might be able to glean useful data and information from recently concluded research project on the economic analysis of household adaptation options to climate change. I summoned all I could muster to at least beat the deadline despite the limited time frame. I reviewed relevant literature and organized my thoughts as I write, guided by the theme of the celebration. I did this kind of writing before mainly for compliance; but this time, I thought I’d aim to win — for a change. I’m giving research tips in this site and I’d like to put them to work. My intention was, if ever I win the contest, I would share pointers in writing it here. And that will make this site a more credible reference for colleagues and students in writing their research papers. So here are the 10 key points that helped me deliver a winning research paper despite the time constraint. 1. Assess your capability and stick to the deadline. Before writing anything, note the deadline of paper submission. Is it still possible for you to figure out a paper before the deadline ends? You have to assess your capability and resources at hand to deliver a paper within the prescribed period. My typing speed of at least 60 words per minute helped me write the research paper with ease as my hands can cope up with what’s in my mind. That speeds up my composition as every idea that comes to mind rapidly goes on paper in real-time. I like blogging and I’ve written hundreds of online articles for the past six years; so putting ideas into writing has not really become much of an issue. This is the reason I encourage colleagues to blog. This will hone their writing skills while at the same time earn something if they join free writing sites that pay their bloggers. Back to the deadline issue, if the deadline is Monday, then by all means, submit your research paper on or before the deadline. Indeed, during the announcement of the winners, the chairman of the board of judges mentioned that research papers submitted beyond the deadline were no longer accepted. I submitted my research paper in the afternoon of the deadline date. 2. Make your research paper relevant to the theme. I made sure that the paper I submitted adheres to the theme of the convention. The convention’s theme focused on the role of health research in disaster and emergency health management. Thus, I titled my paper “Climate Hazard Effects on Socio-Environmental Health and Adaptation Strategies in Two Coastal Communities in Palawan Island.” That’s about disaster’s effect on the health of marginalized communities and how two communities adapted to climatic threats. The communities explored “soft” and “hard” adaptation strategies to make their communities more resilient to the negative effects of climate change. 3. Keep to the rules. See the contest guidelines. I followed the contest guidelines in its entirety. There is a prescribed format for writing the research paper as well as in the slide presentation. I followed the IMRaD format using my favorite word processor. The slides must not exceed 10, so I prepared 10 slides; no more, no less. 4. Do the writing in the morning. I have fun doing my write-up in the morning. My mind works best from 4:30 to 11:30 am. After lunch, my brain goes into a slumber. There’s something in the food that makes me sleepy. According to Ben Biggs, increased serotonin in the brain as a result of eating heartily is the culprit. To keep my writing momentum, I will either eat a small meal at lunchtime, or… sleep. In that three-day writing spree, I took the latter approach, taking a one-hour nap after lunch. I’m alive after that brief trip to dreamland. Surprisingly, I was able to sustain my writing from the usual drowsy 2 pm writing struggle. Somehow, the adrenalin push caused by the nearing deadline counteracted the effect of serotonin. At 4 o’clock, I regain back my writing momentum. 5. Have a good review of recent and relevant literature. Many of the published literature on climate effects are in scientific journals that I have no access at the time of writing. Unfazed by this constraint, I resorted to online material that are both relevant and recent, and of course, free. My references on the weather and disasters were obtained from mostly government-operated sites that I could rely on as these are public service sites. I gathered the most relevant ones and kept my writing concise, summarizing each report as succinctly as I could by applying the 5Ws and 1H technical writing strategy. My certificate of recognition and trophy for winning the third prize during the 8th Philippine National Health Research System (PNHRS) week celebration. 6. Adopt the viewpoint of the reader. I adopted the viewpoint of the one screening the research paper. I have had experience reading and evaluating the work of others so I tried to take the reader’s viewpoint while I read my own paper. This proved to be difficult because I have my biases. But thinking as if I am the judge myself and using the contest’s judgment criteria, I saw critical areas or arguments in my manuscript that need revision. Asking colleagues would have been better, but the brief period to prepare the research paper would not allow it. I will certainly do this once another opportunity arises. 7. Be particular about your grammar. In any contest where English is the medium of expression, a non-native English speaker like me has to rely on previous educational training, readings and references. I did good in English during my high school and college days. Further, I developed my writing skills by reading the composition of great writers as well as practicing the trade, mainly, through blogging. For me, if it sounds right and not really awkward to read, then it’s probably written right. Further, a good word processor can point out obvious grammatical errors. I made good use of it. A veteran research writer colleague reminded me once to keep my sentences brief and concise. This simple suggestion helped me all the way in my writing engagements. Whenever possible, I see to it that each sentence I write contains one idea or a set of ideas that work harmoniously. This writing style simply works. 9. Provide relevant figures and tables. Remember the adage “A picture is worth a thousand words?” I selected figures, graphs and tables that contribute to the message I want to put across. Just glancing at these complementary sources of information improves the readers’ understanding of the research paper. Specifically, for the pictures to include in the research paper, show something controversial or intriguing that will spark a discussion. The picture should be socially relevant if the theme is about people. As for the tables, I adopt three guidelines: 1) limit columns to a maximum of four as much as possible, 2) arrange the title of each column from the most important to the least important information, and 3) provide explanatory notes under the table for better understanding. 10. Direct your mind towards winning. When I wrote the research paper, I thought of winning the contest. I didn’t try this mindset before. My write ups were not written to compete but just to comply with the minimum requirements for participation. I didn’t enter any contest for lack of a good reason to do so. I just don’t like to compete as a matter of choice. How did a changed mindset help me write better? Adopting a winning attitude forced me to bring my talents and creativity to the fore. One of those things that I determined within myself is the idea that I will not settle for anything less as much as possible. I will make my work as perfect as possible if I can afford it. My work should be more than just enough. It should be as excellent as it should, at least in my point of view. So I read and reread the paper many times over. Of course, the time pressure did not really turn out the best in my research paper as I realized some loopholes when I read it again and when the panel of judges were asking questions. But during the time of writing, the composition was the best I could muster. And it worked, because it passed the initial screening. The research paper made it to the six finalists out of 31 submitted for review. A proper mindset allows you to harness your talents and creativity. Stanford University psychologist Carol Dweck argues that people with a growth mindset see their qualities as things that can be developed through years of passionate practice and learning. And I believe I just did that. Finally, connecting ourselves to the Supreme Being and having a noble purpose matters. All these things will not happen without blessings from the One who made it all possible. To Him all glory and honor return. After all, this toil is geared towards the betterment of humanity. Try these tips and see how you perform. Or if you are a winner yourself, posting your thoughts below will be of great help to research writers. This article describes the mango pulp weevil (MPW), Sternochetus frigidus, introduced to Palawan province and discovered in 1987. The weevil still lingers as a pest control problem that prevents local mango farmers from exporting their agricultural produce in other places. Find out how the MPW looks like and where it grows. A video is included to show how this pest behaves when disturbed and how fast it can move. Research still has to find a long-term remedy to the problem of mango pulp weevil (Sternochetus frigidus) infestation in the province of Palawan in the Philippines where the world-renowned underground river is found. Pest control approaches by farmers have so far been unable to eradicate the pest at source which finds the edible fleshy part of the mango as its favorite breeding place. Hence, the name mango pulp weevil or MPW. The weevil damages a part of the mango pulp thus reduce the quality of the fruit. For more than two decades, mango growers were unable to export their agricultural produce because the mango pulp weevil will threaten the mango industry in other places. A post-harvest pest control approach done so far to control the mango pulp weevil include irradiation as quarantine treatment (Padilla 2012). This approach appears to be more economical compared to other post-harvest pest control treatments such as the application of heat and fumigation. Local farmers also apply hit-and-miss approaches to control the weevil at source. How do these pests look like? Below are pictures of the mango pulp weevil. Mango pulp weevil (Sternochetus frigidus) infesting mangoes in Palawan Island. These are two of the four MPWs I have found yesterday upon slicing several fruits from our homegrown mango trees. I can feel that they have a hard texture as I turn them around for the right angles to take photos. The insect is quite small (6mm x 4mm) but switching my Panasonic Lumix LX5 to macro mode enabled me to take extreme close up shots at a distance of less than one centimeter. Overall, MPWs have dominant brown color at the underside and an orange dorsal region mottled with dark, charcoal black bands across the pitted wings. Also, the wings have rough tiny keratinous projections that probably aid them in burrowing through the soft pulp upon maturity. The long snout has two antenna with rounded tips. The two samples in the pictures shown previously were found in just one mango fruit, occupying about two centimeters of the pulp next to the seed. Initially, I thought there was only one but upon closer look, another weevil with neatly folded legs sprang to life after a minute or two. Below is a video of how fast these pests could walk about. If given the chance, they will fly within a few minutes and enter into a state of suspended animation or diapause. Weevils do not fly great distances but usually stay close to the parent tree until the next fruiting season (Gove et al. 2007). Consumers in Palawan can still eat at least half of the mangoes because only one side of the fruit is affected. An alternative way of consuming infested fruits is to flesh out the mango pulp and dry it (dried mangoes). The affected area is normally about 3 cm in diameter. I have not been so keen before on the presence of the mango pulp weevil in the three mango trees we have in our yard. My friend, a City Agriculturist, remarked that I should do something about the mango fruits that fall when ripe as this will infect other healthy mango trees. Based on her remark and on the readings I made in writing this article, I recommend that the following measures should be made by consumers or mango owners. Harvest mango fruits as soon as these are mature. Remove all fallen fruits and destroy pests in infested fruit. Damaged fruits should be buried at least half a meter below the ground to prevent the weevil from completing its life cycle (Catindig and Heong 2005). Kill the pest right away when found in mango consumed. Report to authorities illegal shipments of mango from infested sources. Undertake indigenous ways to control weevil infestation such as natural fumigation or bagging using newspapers or similar material. For researchers, studying local farmers’ practices in controlling mango pulp weevil infestation can help minimize costs associated with pest control specifically the use of synthetic pesticides. Comparing the efficacy of such practices will help identify low-cost techniques or approaches that will reduce, if not eradicate the mango pulp weevil problem. Natural pest control measures such as breeding ants that feed on the mango weevil (Renkang and Christian 2007) may also be explored. Are there ants species in Palawan that can qualify as weevil predators? This ecosystem approach, particularly looking at the food web interactions, may be the more viable pest control option. Is Banning Mango Export the Answer? While banning the exportation of mango fruits from Palawan will prevent pest outbreak in other places, this caused a great loss to mango farmers in the province. Other efficient ways to control the pest must be considered or its economic impact be examined further. Moreover, despite the infestation, it seems that only a small percentage of the mango fruits are affected. Without pesticide use, out of 300 mangoes that we have harvested at home, we found only less than 10 fruits with MPW in it. That’s only three percent. An economic analysis may be done to look at the actual damage caused by this pest. Banning fruit exportation may not really be the answer. Rather, an effective quarantine measure should be applied. Gove, T.; Joubert; J. P.; and M. S. de Beer; 2007. Literature review on mango seed weevil Sternochetus mangiferae (Fabricius) (Coleoptera: Curculionidae). SA Mango Growers’ Association Research Journal 27, 21-28. RenKang, P. and K. Christian, 2007. The effect of the weaver ant, Oecophylla smaragdina (Hymenoptera: Formicidae), on the mango seed weevil, Sternochetus mangiferae (Coleoptera: Curculionidae), in mango orchards in the Northern Territory of Australia. International Journal of Pest Management, 53(1):15-24. Do you know that mind mapping is a useful research tool? Here are five tips on how to make a mind map in developing and enhancing your research topic. An example mind map on climate change is provided at the end of the article. A mind map can portray relationships and interactions between the different variables or factors that arise from a given topic. For this reason, mind mapping can be effectively used in generating ideas to enrich and enhance your research topic. You can use your mind map in writing the introduction of your research paper or identify gaps in knowledge while preparing your review of literature. How do you keep the ideas flowing and enrich your mind map to show everything that comes to mind? The following are five tips on how to make a mind map for research purposes. 1. Don’t evaluate too much. As you prepare the mind map, you will have the tendency to stop and evaluate if you did connect the right factors or variables that come to mind. This is because you are still unconsciously bound by rules or standards set to conform with the norm. You want to conform with what you have learned or what other people have set before you. You need not be concerned about these rules or standards but allow your mind to flow smoothly or wander. Just let it go where it can comfortably go. Starting with the central idea, connect any subtopic that comes to mind. Don’t ask yourself whether that subtopic or idea is appropriate to connect with the central idea or not. Just quickly write it and connect with the central idea. 2. Give a time limit for each subtopic listed down in your mind map. Allow only a few seconds to ponder on a specific subtopic you have written. Don’t let a minute pass on a single topic so you can populate your mind map with more ideas. Preparing a mind map is an opportunity to be creative. You need not only words to express what comes to your mind. If you want to draw a symbol, scribble a note, place a quotation or anything that reminds you of a particular topic, do it. 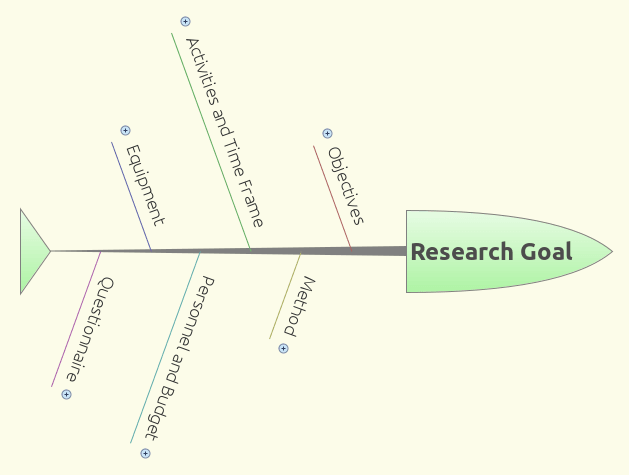 Graphical entries make your mind map more interesting. Oftentimes, we have the tendency to overanalyze things or plan too much. This is referred to as analysis paralysis. It’s a hindrance to a productive endeavor. Don’t be a perfectionist in making your mind map. Briefly analyze how the variables or factors relate with each other and then go ahead with the other components as swiftly as you can. Through constant practice, this will help you process information quickly. 5. Read a lot. Your mind map is only as good as your exposure on a given topic. Therefore, it pays to educate yourself on the specific topic you want to write about or do research on. Applying these tips, I prepared a mind map on climate change as the main theme. Many variables come into play and get incorporated in the mind map as I let my mind wander. I tried to be sensitive on what subtopics my mind suggests to incorporate. Using the tips above, here’s an example of a mind map that I have produced in a matter of 30 minutes using a free version of XMind, a mind-mapping software. Example mind map on climate change (click to enlarge). Try these tips and enhance your creativity in preparing mind maps. Do you have a fast heart rate, i.e., more than 80 beats per minute? Chances are, you are either stressed or not getting enough exercise. Find out how aerobics can slow down your heart rate. I have this nagging question in mind since I decided to undertake an aerobics program using Dr. Kenneth Cooper’s book on aerobics. This is about one’s heart rate getting slower when regularly exercising. Did my heart rate actually slow down because aerobics exercise has become an integral part of my weekly routine? On page 101 of Dr. Cooper’s book aptly titled “aerobics,” he mentioned that the heart is such a magnificent engine that, when given less work, will work faster and less efficiently. When you make more demands on it through aerobics, it will become more efficient. That means that for a deconditioned man who does not exercise at all, his resting rate is about 80 or more while a conditioned man who exercises regularly, will have a resting heart rate of about 60 beats per minute or less. In 24 hours at rest, a deconditioned man’s heart will have to beat more than a conditioned man. He went on to explain things about the heart and how it becomes stronger and more efficient with training. While browsing information along this topic, I found out that top athletes have heart rates of less than 30. Miguel Indurain, a top cyclist has a heart rate of 28. Does Aerobics Slow Down Heart Rate? I love to do a simple research to test this information although I am aware that there were already studies done to answer this question. I would like to answer the question using myself as the subject of the study and to see my progress. This is my case. Does aerobics slow down the heart rate through time? I decided that I will use the graphical approach to find out if my heart rate indeed is slowing down through time. This is what researchers call a time series analysis. Will the heart rate trend be going down? I recorded my heart rate each time I check my blood pressure upon waking up in the morning using an OMRON REM-1 wrist blood pressure monitor. So, I have added information that I will include in this article – my blood pressure. I started recording the BP information and heart rate last August 8, 2013 up to this time. I do this routine before my 6 o’clock am run so it’s basically my resting heart rate after 6-8 hours of sleep. There were no significant changes in my lifestyle (i.e., no changes in diet, medication, workload, among other things) since I embarked on the aerobics program. I plotted data gathered for eight months although I have done aerobics since January 2013. But then I failed to record heart rate or BP data until August 2013. I found out interesting information after plotting the data in Excel. This is easily done by plotting the date and corresponding BP values and heart rate in one row. I clicked on the Insert menu then hit the Line graph and selected the cells for date, diastolic, systolic, and heart rate values. Indeed, my heart rate decreased through time as indicated by the heart rate trend line. However, I noticed that the trend for blood pressure goes towards the opposite direction. 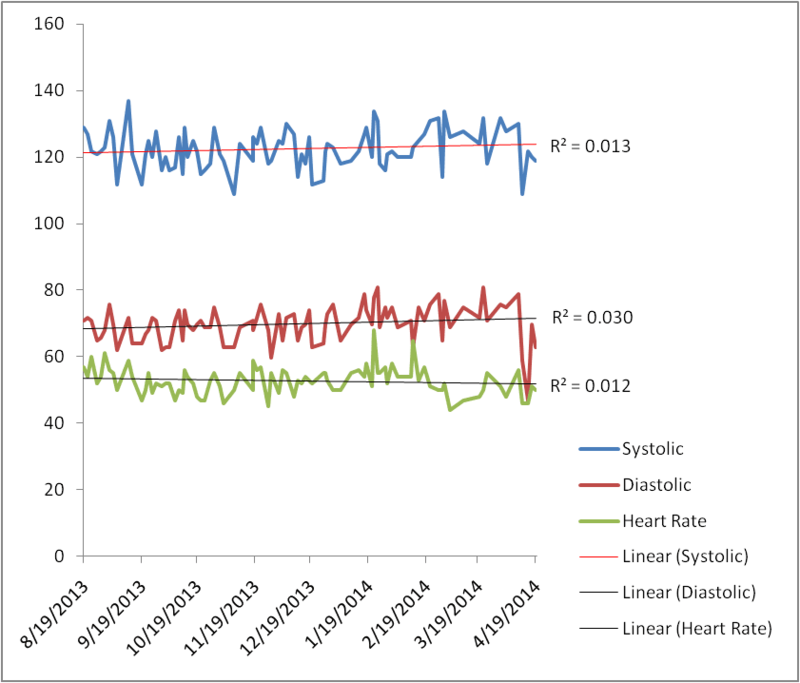 Both the systolic and diastolic pressure follow an upward trend (Figure 1). Fig. 1. Graph of my blood pressure and heart rate from August 19, 2013 to April 19, 2014. What does this result suggest? This may mean that as the heart grows stronger (low heart beat), the pressure it exerts on the blood vessels also increases. On the other hand, this suggests that my blood vessels become less elastic through time. This finding requires further reading – a review of literature focused on the relationship between the heart rate of a healthy person and his blood pressure. Is this trend the same for all people who engaged in aerobics and experienced the training effect? Training effect is the body’s adaptation to a training program manifested by improvement in functional capacity and strength. In my case, this simply means that I am able to run a 6 kilometer stretch of road without stopping to rest. When I started the aerobics program last January 2013, I can barely finish a mile and my legs ached. Well, whatever the increasing blood pressure means, what is important is that I found out that aerobics does decrease the heart rate through time. On March 4, 2014, I recorded my lowest heart rate ever: 44. And I confirmed this by manually counting my pulse in one minute. And I also discovered that I can lower it at will by breathing deeply. Where does this training bring me? An athlete friend invited me to join a 10K run last February 23, 2014. He noticed that I jog regularly and assured me that I will be able to finish the distance. I explained that I have been jogging just to address a health issue and is not that confident to test my performance. On second thought, I said why not? I realized I can make the distance and gained confidence that I could be a marathoner. In fact, I’ve already joined and finished two 10-kilometer runs clocking 1:05 and 1:00, respectively. And I aim to finish the upcoming 10K run next month in less than an hour. This was made possible through serious self-training and with determination. Do you have high blood pressure? Or easily feel tired after a few exertions? Try aerobics and take control of your health. Just a note of caution: before engaging in strenuous exercise, have a medical check up to rule out any heart problem. One of the most difficult things associated with thesis writing is coming up with a good research topic. How can you generate one? What should you do? This article provides a simplified approach to this common concern of those new in the field of research. You may find writing the literature review confusing, and feel that you don’t know where to start, as this part of research writing requires familiarity with the research topic being investigated. Familiarity will not happen unless you have read a great deal about what work or progress has been done to shed light to or understand why things happen the way they do, which in science is referred to as a phenomenon. The ultimate aim of a review of literature is to provide background information about a phenomenon using existing relevant and reliable or credible literature. Scientists attempt to explain phenomenon, which, as expected, will always show a dearth of information on some aspects and fall short of your expectations. Along the way, as you examine the literature, there will always be questions in your mind, which you try to resolve by reading more – hoping that there will be answers to your questions somewhere. In the end, you will find yourself still looking for answers to your set of questions but find nothing that addresses your curiosity. Have you read enough? There’s a possibility that you might have not read everything, that there may be some literature that you have missed somewhere, somehow. So, when should you stop reading relevant literature and conclude that indeed you have reached that point where you are convinced that no one has ever done anything or failed to answer adequately the questions that you have in mind? How can you ensure that you have exhausted available literature such that you are able to declare that there is a GAP in knowledge, and come up with your unique research topic? In reality, this is not an easy task, especially if you are new to the field of inquiry you are in. This is the reason scientists specialize or stick to a particular study, research endeavor, or research topic for many years, trying to synthesize all work and fill in the gaps that will help explain phenomenon. The idea is to bring together all work there is available for scrutiny and get useful insights and hindsights – what has been done and what has been left undone. These initiatives should be made known to everyone concerned through peer-reviewed publications. Why peer-reviewed? That is because, persons working along those lines of inquiry will recognize that indeed, what you are doing is something that they do not know about and which they would want to know. For all intents and purposes then, your gauge in saying that there is a GAP in knowledge, is to read the work of those scientists or researchers who are recognized authority on those research topics you want to explore. These scientists or researchers publish their findings in reputable scientific journals. What they are saying or have done so far, will serve as benchmark or springboard for further inquiry. How will you know that a person is knowledgeable or the authority on a certain topic of inquiry given that you are new in that field? Well, one way to do so is to see if he has other research papers on the same topic available for examination, or probably see his credentials. After all, those in authority in a given field are those who can convince everyone that what he is doing, his arguments, are the most sensible explanation of a phenomenon. But if you have a better idea, then show your evidence. Who knows, your suggestions or propositions are better than anyone else’s. A well written, comprehensive and logical literature review demonstrates good scholarship. But many students usually find themselves with only a few articles to figure out their research topic. How will they approach this problem? Here are five techniques to review related literature. The past month had been a hectic one for me as I adjust to my new schedule after a long leave from academic work. I need to handle subjects which require intensive gathering of materials for both syllabus preparation as well as lecture sessions. I was assigned two classes of third year undergraduate students enrolled in Research 01, many of whom have not had any experience on doing research in their high school years. As I introduce the subject to them, bug-eyed students wonder on what the heck I was talking about. Honing research skills such that students are able to do independent research poses a challenge to anyone handling this subject. Simplyeducate.me proved to be a useful site for them, as I encouraged them to visit the site and learn the ropes of research. They were just glad to read something from someone they are familiar with, and even get that opportunity to ask me personally about their concerns. They need not surf and spend so much time online just to get some ideas useful in working out their thesis. I asked them to come up with their respective topics, that is, related to their respective fields. This is not easy as it would require a lot of observations and readings to pin down what specific topics they are interested in. To narrow down their frame of mind on what specific topics they need to look into, I gave them the university’s research agenda to guide them along the way. These agenda include climate change concerns for those enrolled in environmental science and alternative approaches to common ailments for those taking biology. To get a better view of the topics the students are interested in within the agenda mentioned, they should read related literature about those topics. So how should they go about it? Below are five tips that can prove helpful. 1. Visit open access journals. One of my favorite open access site where I can download literature on many topics in environmental science is www.doaj.org. In this site, there are full papers available for free download. You just need to be patient as you browse the site using your keyword. Elsevier also has a list of open access journals here. There are many other open access journals if you have the time and the patience to do surfing. While these may be free, you will notice that your choices are limited. And you also need to be aware that there are open access journals which are predatory, meaning, it seeks to exploit or oppress others. Beal provides a comprehensive list of these questionable journals. It will always help if you read some reviews before spending your valuable time on those listed, especially if you intend to publish your research output. If you have no better choice and can spend ample time to look for those articles which you believe can help you develop your research topic, open access journals are the default choice at least for a start. Verify if your library has paid subscriptions to popular scientific journals which offer more choices. This will cut down time for you to be able to understand current research and establish the state of the art. 2. Ask a professor for copies of their article collections. One MS student approached me the other day asking if I have literature on community based resource management. Indeed, her inquiry bore fruit as I subscribe to a biannual environmental science journal. I lent her six issues and she was so grateful for the help. Don’t hesitate to approach someone who might be working on something similar to your line of interest. Almost always, there’s a pile of literature he can share with you so you can quickly browse the topics. 3. Join sites where scientific articles are shared. One of the growing websites that many scientists join is academia.edu. A colleague reminded me that is a good source of scientific articles, because some generous scientists upload and share their articles for everyone to peek into and possibly include in their list of related literature. You may also write those scientists who might be interested in your proposed investigation. I uploaded an article in portable document format (PDF) myself and I noticed high traffic on that single article alone. Now, academia.edu boasts 7,133,903 member researchers. 4. Visit relevant government offices. A trip to government offices who usually have mini-libraries store information on office programs, projects, and activities plus other informative materials for public use can help you enhance the quality of information in your study area’s profile. Statistics on demographics, detailed maps, and recent public service initiatives are commonly found in these offices. Research is meant to improve the quality of human life, and the government is tasked to provide welfare to the general public. Thus, you can orient your research to address issues and problems that were already identified in such government offices. If your study is about the environment, then the sensible choice is the environment agency of the government. You can help improve on or enhance current environmental policy using identified issues and concern on the environment as government employees interact directly with local communities. Surely, your research will be appreciated by policy makers. Why do the literature by yourself when you can engage the help of others — for a fee, of course. I did this when I was conceptualizing my research topic. I learned that there was a group of graduate students who offered to do the literature review for a fixed rate. They do all the legwork, i.e., scrounging the libraries and finding relevant materials based on my set of keywords and problem statement. That surely saved me a lot of time while I narrow down my research topic using my collection of related literature. The added material will strengthen my arguments and/or redefine the direction of my investigation. If you prefer to do things online, see the most common types of sources in a research paper.